In his campaign speeches, GOP presidential candidate Mitt Romney has made it carbon-clear: if you live on his planet, you're going to be consuming "good, old-fashioned American power"--the kind produced by coal, oil and uranium. "You can't drive a car with a windmill on it," Romney scoffs. Well, sure: a windmill bolted atop a car is a zany image. But what would a car look like if it were powered by one of Mitt's preferred fuels? An oil-powered car would have a metal derrick rising from its rooftop and it would be pinned to the ground by a mile of drilling infrastructure. Adding to the inconvenience, it would most likely be parked some distance from your front porch. Say, in Saudi Arabia. 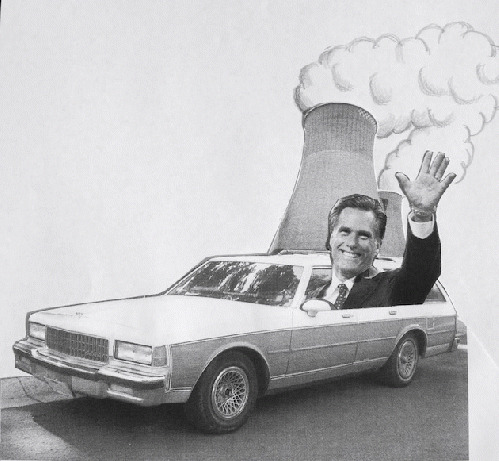 If Mitt's ride were a coal-powered sedan, it would be a real clunker. In the US, the "latest model" would be 20 years old, there would only be 600 on the road and it would take 2.2 billion gallons of water and 2,333 tons of coal to run one for a year. The tailpipe would puff arsenic, sulfur, radioisotopes, soot, and greenhouse gases. Acid rain from your exhaust would probably kill your neighbor's begonias. If a reactor were like a car, the radiator would no longer fit under the hood. With 33% thermal efficiency, your car would spew clouds of superheated steam visible from 20 blocks away. Every 17 months or so, you'd need to stop and replace the engine. Instead of a gas station, you'd need to visit a specialized garage where a team of highly paid mechanics would spend two months completing the refueling process. If a car was nuclear-powered, you could never walk off and leave the engine running. With a regular car, the engine eventually runs out of gas and stops. With an unattended reactor, the engine eventually runs out of control and explodes. And when it reaches its mandatory retirement age, there won't be any junkyards for your car. You'd need to encase the radioactive hulk in concrete and store it in your backyard--for 25,000 years. On the other hand, imagine if a reactor was treated like a car: If three Ford Explorers parked side-by-side on the coast of Japan suddenly exploded--one after another--the government would surely order a recall. All things considered, I'd rather take my chances on a car with a wind turbine on the roof. Gar Smith is editor emeritus of Earth Island Journal and author of Nuclear Roulette: The Truth about the Most Dangerous Energy Source on Earth (Chelsea Green). Gar Smith is a Project Censored Award-winning reporter and is co-founder and editor of Environmentalists Against War and the author of Nuclear Roulette. Hillary's Email Bombshell: Saudi's Financed the Benghazi Attack - World Beyond War . . .
Russia Calls House Bill an "Act of War." Will the Senate Block H.R. 1644?